Donald Alistair Macdonald Brown (# 9 in the list of senior men to represent Great Britain) was born in Birmingham in December 1921. 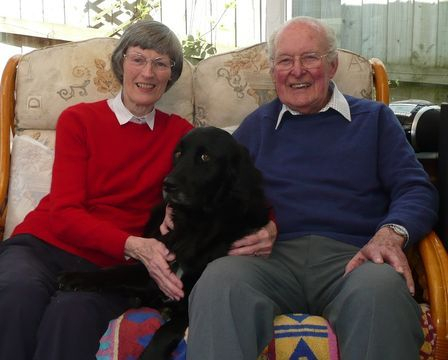 Although he would only live here for the first two weeks of his life this meant that in later years he was eligible to compete in the Midland Counties Championships, however, all that was not to be for another 20 plus years. Interestingly, whilst he prefers to be simply known as Don Brown, it is a little known fact that his first name that he was Christened with is actually David and that the name Donald was a "nickname" given to him by his mother in recognition of a local surgeon. Don's parents were both Scottish although throughout his early life he spent time travelling backwards and forwards between London and South Wales whilst his parents plied their trade as travelling show people. In fact, Don himself would often find himself sleeping in one of the costume trunks that used to travel with the family. It was whilst the family were travelling that Don first got on a pair of roller skates at the age of eight, but serious competitive skating was still some way off. By the age of 14 Don and his parents had settled down in the Highgate Village area of North London, just a bus ride away from the Broadway rink at Cricklewood. Don quite often went to the rink but at the outbreak of the war in 1939 he again found himself back in South Wales on a regular basis to avoid the London bombings by the Nazis. Despite this, some weekends he would go back to London and go to the rink for some leisure time. It was during one of these sessions in 1940 that he was invited by the Broadway speed club to take a speed test. He duly did so and posted a time that impressed the club to take him on as a member. Throughout the war there were no competitions of note other than club competitions and Don himself was drafted into the RAF. Stationed in Manchester he and some RAF colleagues set up a roller hockey team, although speed skating was still his passion. 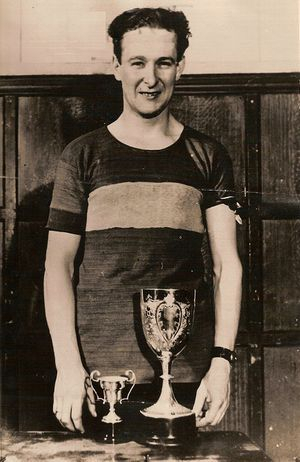 Although now in his mid 20's Don was still a relative newcomer to the speed skating fraternity having yet to take part in a national competition, but with the likes of Frank Lamb and Geoff Sanders to help him along, both British Champions in 1947, Don was soon knocking on the door of success himself. In 1948 the Broadway club decided that they would not join the NSA, the recognised governing body at that time in Great Britain for all skating disciplines, both ice and roller, but rather would join the BFARS (British Federation of Amateur Roller Skaters). This was a breakaway organisation under the umbrella body of the RSROA (Roller Skating Rink Owners Association) - which was a global entity that had members in the USA, Canada, India and New Zealand. As it was, both the Cricklewood and Birmingham Embassy rinks were associated to the RSROA and in 1948 an "unofficial" (in the eyes of the NSA at least) British Championships was held at the Birmingham Embassy rink. The only clubs to take part were Birmingham and Broadway and Don, having just been demobbed from the RAF, went on to make an immediate impact and win the One Mile event with his young team mate, Denis Hill, taking the Five Mile. In fact, at the RSROA World Championships held in Oakland, California, USA, Frank Lamb went on to win the Two Mile World Championship. It is unclear whether Broadway and Birmingham were excluded from the NSA Championships or whether they chose to do so, but what is clear is that in 1948 the "official" British Championships were only contested by the Alexandra Palace club and a few lesser clubs, resulting in a clean sweep of all medals in all events for Alexandra Palace as well as making up the entire British team that would take part in the World Championships in Monfalcone that year. In 1949, however, Broadway made a return to the NSA, and the dominance of the Alexandra Palace club the year previous was firmly put into perspective. On the 22nd January that year the One Mile Championship was at Granby Halls, Leicester. Don Brown was now a force to be reckoned with and in this event he came out of the last bend and crossed the finishing line thinking he had won his first British title, however, on his outside was a 17 year old Denis Hill who did his now trademark lunge for the line and in so doing became the youngest ever winner of the One Mile Championship. Still, Don had got his first Championship medal. Two weeks later, on the 12th February was the Half Mile Championship on the very small and very tight Herne Bay rink. Don was always known for his quick start and on this day it was no exception. Leading all the way he crossed the line first ahead of Hill and at the age of 27 had won his first British title. In September that year, he, Hill and Alexandra Palace's Bob Halford were the three man team that went to Ferrara, Italy, for the World Championships on the road. Although no medals, Don was the highest placed British skater with 6th in the 1000 metres. Three months on from that and Don was again competing for Great Britain in the World Championships on the track in Lisbon, Portugal. The track was small but Don's rink ability came to the fore. He was just pipped to a place in the next round of the 1000 metres pursuit literally by inches by Belgian World Champion and legend, Jos Weynen, who commented on Don's ability after the race, but it was the distance races where Don's talents really shone. Don achieved two bronze medals, one in the 10000 metres and the other in the 20000 metres. Coupled with these he and Hill went on to win the Coupes des Nations relay. With fellow club mate Jackie Reeves the third member of the team, Great Britain were crowned overall Champions as the number one nation on points. It was a tremendous achievement not only for Don, Denis and Jackie, but for the Broadway club back home whose skaters had made up the entire British team. Shortly after his return from Lisbon, Don was already having to think about defending his Half Mile title. On 28th January 1950 at Granby Halls, Leicester, he did just that and did so successfully to take his second title of his skating career. There were no World Championships in 1950 (possibly due to there being two in 1949, one of which was in December) so all of Dons efforts were on the domestic racing. 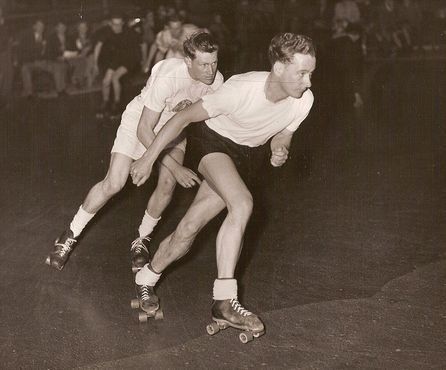 In February that year Don was one of the four Broadway skaters that would win the British Inter-Club Relay Championship for the Burgoyne Shield and release Alexandra Palace's stranglehold on the prestigious trophy. Later, in November, Don won the Midland Counties Championship on the Birmingham Embassy ahead of Birmingham's Leon Goodchild and Jack Struggles. His birth and subsequent first two weeks of his life having been in Birmingham allowed Don to compete in this event despite having spent the previous 29 years living mostly in London. On 20th January 1951 Don set out once more to retain his Half Mile crown. Only one man had previously won the Half Mile three times in a row since it was first raced for back in 1924 and that was Alexandra Palace's Eddie Stumbke (1932-34). Don was once more triumphant ahead of Birmingham's Bunny Bennett and Jack Struggles. Unbeknown to Don at that time, this third individual gold medal would be his last. In March he was again a silver medallist to Denis Hill in the One Mile and in April was once again a member of the Relay Championship winning Broadway team. Later that year Don took part in his third and final World Championships in Monfalcone, Italy, again with team mate Denis Hill, but this time also joined by Brixton's Ron Coopey. There would be no medals for Don this time although his performances were still of an elite standard. As 1952 started there was talk about Don working abroad. The company he was working for was Rolls Razor Limited, whose factory was also on the Broadway at Cricklewood as per the roller rink. They wanted Don to work for them in New Zealand which was something Don considered and was excited about doing. Before that, though, there was the small matter of defending his Half Mile title once more and should he be victorious would become the first skater to win the Championship four times in succession. Unfortunately, it was not to be. Don was beaten into second place by team mate and friend, Jackie Reeves. Always gracious in defeat Don commented that Reeves was a much deserved winner. His final Championship outing was in March when he again helped Broadway win the Burgoyne Shield for a successive third time. By May, however, Don was the centre of a farewell party held by his skating friends and colleagues and left these shores on his four week voyage to pastures new in New Zealand. 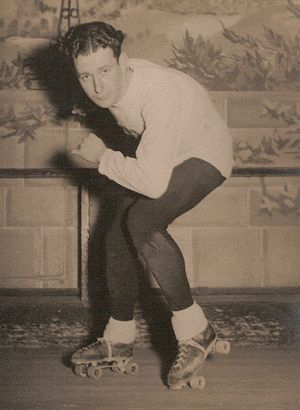 Don was to spend three years in New Zealand and taking his skates with him he trained with and raced for the Otago Speed Skating Club and entered competitions whilst based there. Most notably was his inclusion in the Half Mile and One Mile Championships of New Zealand in Christchurch in July 1952. Despite having not trained for several months Don would finish a creditable 4th in both events but by that time, though, skating was more of a past time for Don than serious competition and although he enjoyed his racing, his dedication to the training and his ambitions for success were secondary. In 1955 Don returned to British shores and renewed old friendships with the Broadway club. His competitive skating days were well and truly over but he still made himself available as a judge. By doing so he kept his interests in speed skating very much alive and was always keen to lend a hand and give advice when asked. In 1958 Don was asked by the NSA if he would be the British Team Manager for the forthcoming World Championships in Finale Ligure, Italy. It was one of the few accolades Don had missing from his skating CV and a request he simply could not refuse. It was Don's first and last time as the national team manager but even so the trip was not without success and was memorable for the introduction of an 18 year old Danny Kelly into the world of international speed skating. Kelly would take home two silvers and a bronze from these championships (and of course would go on to win a World title some five years later). Around 1960 Don was introduced by Bob Halford to British artistic skater and Champion, Maureen Jackson. Maureen, herself, was no stranger to speed skating having been engaged for a while to GB international speed skater, Dennis Stafford (whose single British outing coincidentally was in 1958 under the management of Don Brown). Now, though, Maureen was single and in 1962 Don and Maureen were married. Don continued for a short while to attend race meetings and judge, but now other interests were part of his life, not least of which was his family. Don's last visit to a race meeting was the European Championships held at Southampton in 1980. Don may well have kept his distance since then but his life, times and successes as a British speed skater truly make him one of Britain's skating legends.